Very hard to spot (and snap a picture of!). 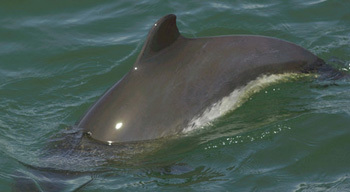 The harbour porpoise is usually alone or in pairs but sometimes also in small groups. Dives only for a few minutes. The smallest of all whales. Seen from June to October. Often in pods of many dozen individuals.